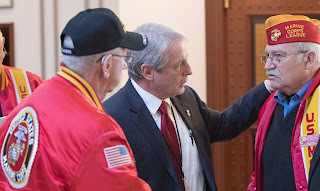 Sen. Len Suzio (center) speaks with state commander of the Marine Corps League Funeral Honors Salvatore V. Sena Sr. (right) prior to a Jan. 30 public hearing at the Legislative Office Building in Hartford. Veterans from across Connecticut attended the hearing in support of Suzio’s proposal to de-fund the state’s study of a potential mileage tax which would require a GPS tracker in trucks and cars. Suzio and the veterans questioned the State of Connecticut’s priorities, noting that as state government is spending hundreds of thousands of taxpayer dollars to study the feasibility of a by-the-mile tax, state funding for the Connecticut Honor Guard is on the chopping block. The honor guard provides rifle salutes at Connecticut veterans’ funerals. Testimony in favor of Suzio’s proposal may be emailed to TraTestimony@cga.ct.gov . The email should include the sender’s name and town, and the subject line should note support for Suzio’s Senate Bill # 76. Taxpayers may also copy Suzio on the email at Len.Suzio@cga.ct.gov .